Use extreme caution as there is a layer of ice under the trails. Plowed fields may be rough. Please call the Snowmobile Alliance 24-hour Hotline at 920-699-SNOW (7669) daily for current information. 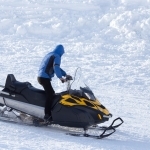 Snowmobile trails in adjoining counties may be closed. Trail users should check with each county to determine trail status.